Holiday card time! Minted giveaway! Have you ordered your holiday cards yet?? Have you checked out the cute cards and home decor goodies Minted has? One reader will win a $125 gift card to use toward a Minted purchase of your choice! My pal Janae at Minted sent me these beautiful cards I ordered (after much deliberation, seriously it took me so long to decide) and I am in love. I used a photo from our anniversary session with my lovely wedding photographer Becky of Studio 623 Photography, and I used a simple design from Minted's photo holiday card selection. Also, they come with pre-addressed envelopes (it's easy to submit the addresses in a .csv file). LIFE SAVER!! It's so easy to compare card options and photos with Minted's Find it Fast tool. You can upload your photos and preview all the cards with each one for quick viewing! And open a million tabs with each card idea as you decide. See? I chose rounded corners and I think I changed the font size or placement a little, but the simple design we went with was great as-is and I love how they came out! Seriously, that pre-addressing feature is amazing, too. I think they'll always offer the free printing of the return address on the back, but for a limited time this year you can also get free recipient addressing at Minted! There were tons of pretty designs to choose from, too. So, for the giveaway. 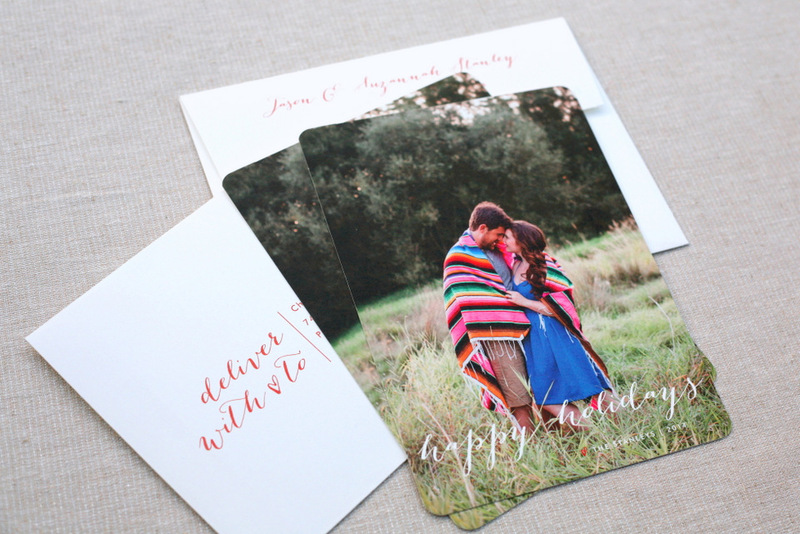 Now through Monday (9:00 PM PST), enter to win $125 to spend at Minted! Minted is a design marketplace connecting you with the world's best artists. Truly original holiday cards sourced from indie designers. Spread holiday cheer with the perfect card. Create a holiday card like no other. Minted had unique accessories to add the perfect finishing touch and make it your own. New this year: The Minted Envelope -Save time and make an impression with beautiful envelope designs and recipient addressing – FREE for a limited time. If you don't win, there's still time to buy your holiday cards at Minted! Update: Congrats to Danielle, winner of the giveaway! I don't know about holiday cards but I'm getting stoked to print my graduation announcements soon. I'll have to check out Minted! oh i love minted. i just ordered my save the dates from them ! Love, love LOVE your dress! It reminds me so much of the tulle ballerina length gown that my mom wore when she got married in 1956. Unfortunately, she loaned it to a cousin and it was horribly stained, so I didn't think I could do anything with it for my second wedding a year ago. So, I designed and made a Celtic style gown with hand-beaded diagonal rows of grapes on the bodice, and navy godet inserts on the skirt. Your wedding dress and bridesmaids' dresses are such a refreshing burst of originality! I abhor the cookie-cutter white strapless gowns that are so prolific. I salute your creativity and genius! i adore your cards and that fast find is awesome! Holiday cards are so much fun to design and send! We just had a baby in September, so we are really looking forward to doing a family photo holiday card this year! Wonderful photo, and how smart for the website to let you preview your picture on all their various card templates to see what you'd like! Beautiful! I love the image and design you chose, and can't wait to pin this! I need this as I have a baby due momentarily and won't have time to address Christmas cards this year. I'm loving the Winter Brush Christmas cards at Minted! They're so classy! I love your cards! They're really nice, love the rounded edges! Also love how it doesn't look really Christmasy. I love Minted - aside from their cards they have a great selection of paper, journals and fabric too! I love Minted cards... your cards came out great! I am planning my new years cards now... so many decisions! Love these! And Minted's addressing feature makes it priceless in the world of holiday photo cards. Minted has THE nicest photo cards I've seen! I also want to get some business cards from them. Oh, thank you!! Cool story! Thanks so much! Perfect!! They're way more exciting when there's a cute growing baby/kid in them! I love minted, they have such beautiful designs and great quality. 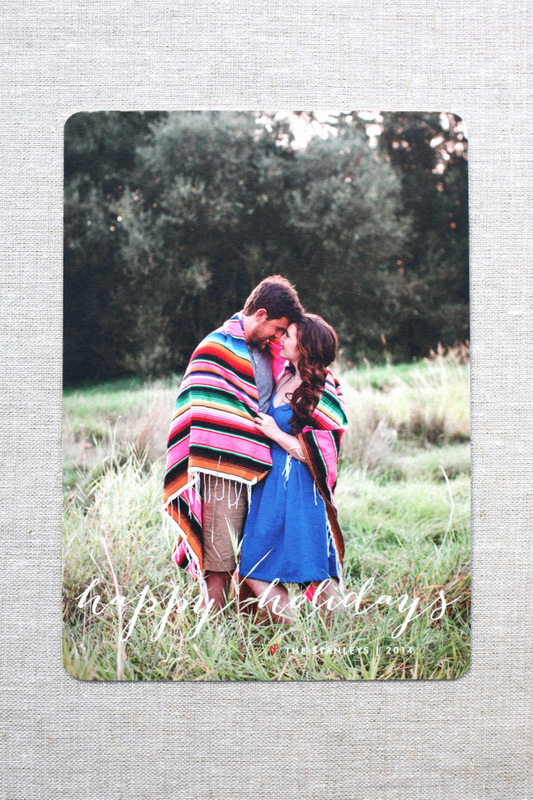 I love the variety of options on Minted, especially their new stuff! I've always loved receiving holiday cards. There's something so personal about them, even if it's just a card from a bulk pack or one that costs less than a dollar at the store. This is timing...I was just looking at the Minted catalog this morning! I love so many things, but the foil "California" print is a done deal! 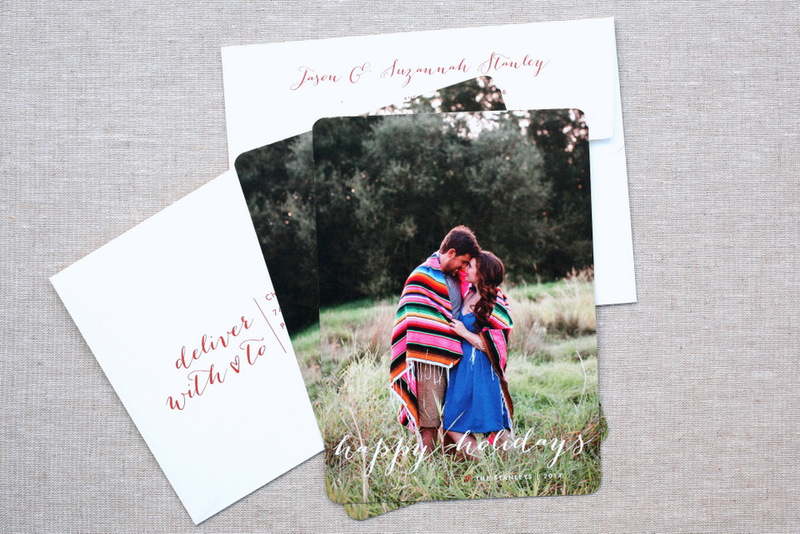 I love the aglow cards from minted and would love to win!! I'm an occupational therapist and we could do this with our patients! Love it! We've had them making salt dough ornaments and painting them, as well as oragami ornaments too. That would be very cool! You could also put them together with fabric glue or even a glue stick for lighter weight fabric. I love the personalization and recipient pre-printing! I would love to win some cards! That is fabulous, what a good job you did! It is a great idea, but the hemline does wreck the look. I'd cut the scallops at the end, and satin-stitch over the scallops with some wash-out interfacing to stabilize the threads from curling the fabric under while sewing. The puckering in the stitching can be avoided by not pulling/pushing the fabric through your machine, but rather, allowing the feed dogs to move the fabric for you. can I suggest an easier way - what about if we fixed zigzag (2 cm wide) similar to dress color doesn't this make similar result and save more time? what do you think? That would get the same shape, but not the smooth look. Would also be cute though!